Every so often an informational book comes along that doesn't put me to sleep. 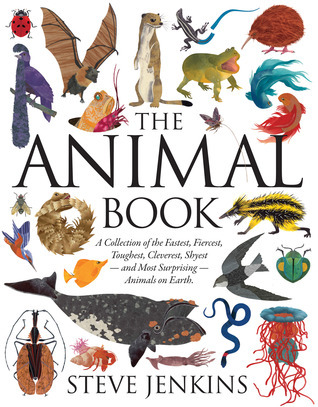 The Animal Book by Steve Jenkins is one of those books.The information presented in The Animal Book is the type that you would find in a textbook, but somehow it manages to be engaging and accessible rather than dull and lifeless. All I can say is what a beautiful work of art Steve Jenkins has created. As someone who is not usually a fan of books filled with nothing but facts rather than story, I couldn't help but find myself hypnotized by Jenkins's gorgeous paper collage art. Despite the fact that an informational book of this type would normally be filled with color photographs, it was a huge risk for Jenkins to create it using nothing but paper cutouts. And yet, it would not have had the same impact had the illustrations been real photographs, which is a testament to the artistry and diligence of Steve Jenkins. I look at the 200+ pages of this book with its multitude of illustrations on each page and think to myself: how did it not take him fifty years to put this book together? It is one of the most unique books I have had the pleasure of reading. If I were still in the classroom this year I'd be seeing this book passed around from hand to hand without ever making it to the bookshelf, I am sure of it.